The opening three daily declines of 2015 have done little to change the broader trend. 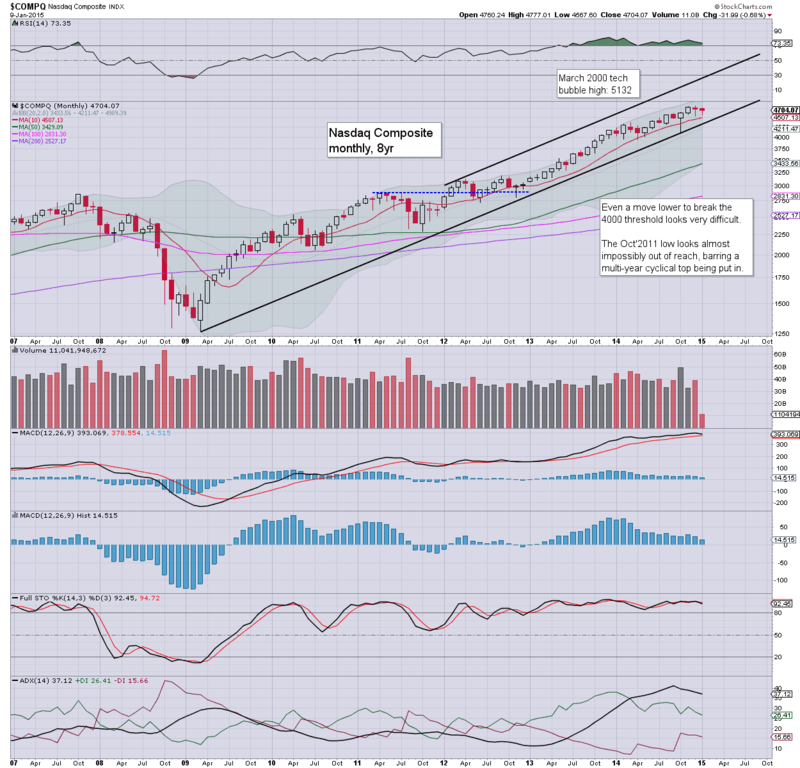 All US equity indexes are continuing their climb from the key low of sp'1074 of Oct'2011. 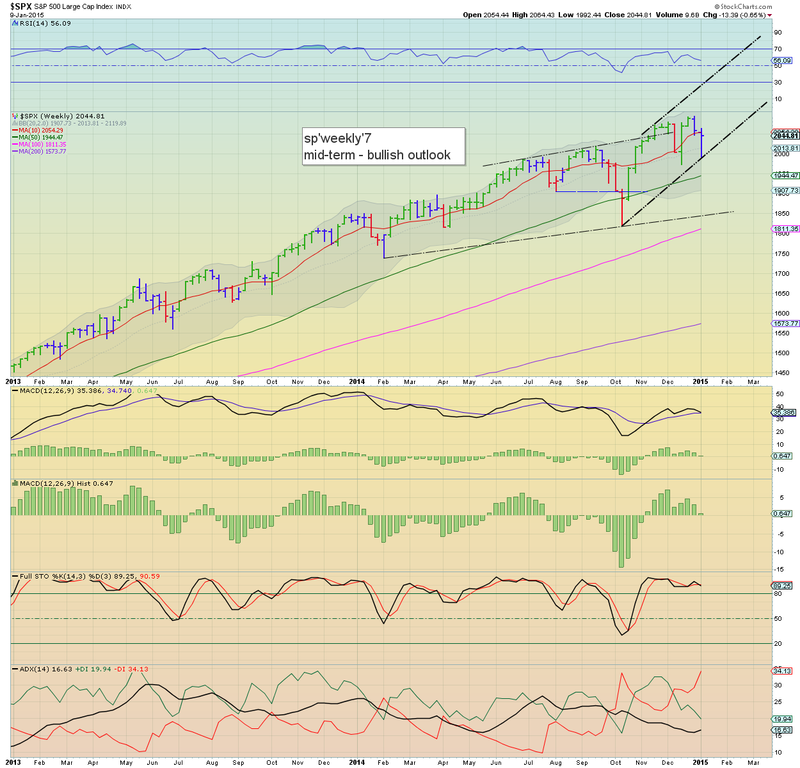 The sp'2100s look viable before end January.. with the 2300s by late spring. With the powerful rebound across Wed/Thursday, the sp'500 is only lower by -0.7% after 6 trading days this year. 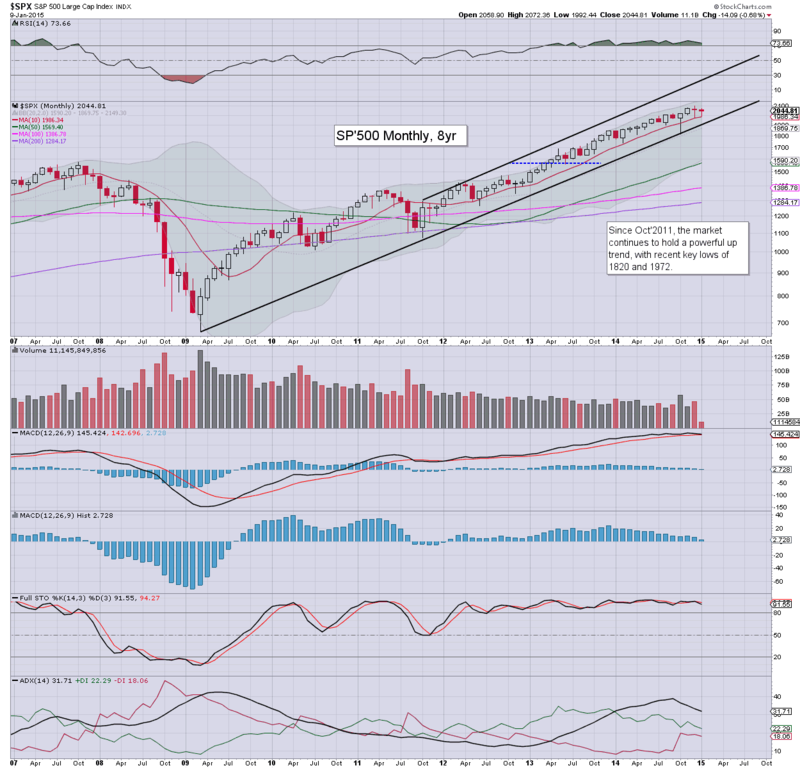 The monthly 10MA continues to act as first key support. The brief Oct' failure was merely a 'cruel tease to the bears'. It is notable that underlying price momentum - see MACD (blue bar histogram) cycle continues to tick lower.. and again turned negative this Tuesday - but only for 2-3 hours! In Oct' we saw the MACD cycle negative for 2-3 days. Unless the equity bears can get a monthly close under 1900 (as of end Jan)... or 2000 (as of end April)... there is ZERO reason to consider the broader trend in any real danger. In terms of upside, the upper bol' is offering the 2140/50s in the near term. 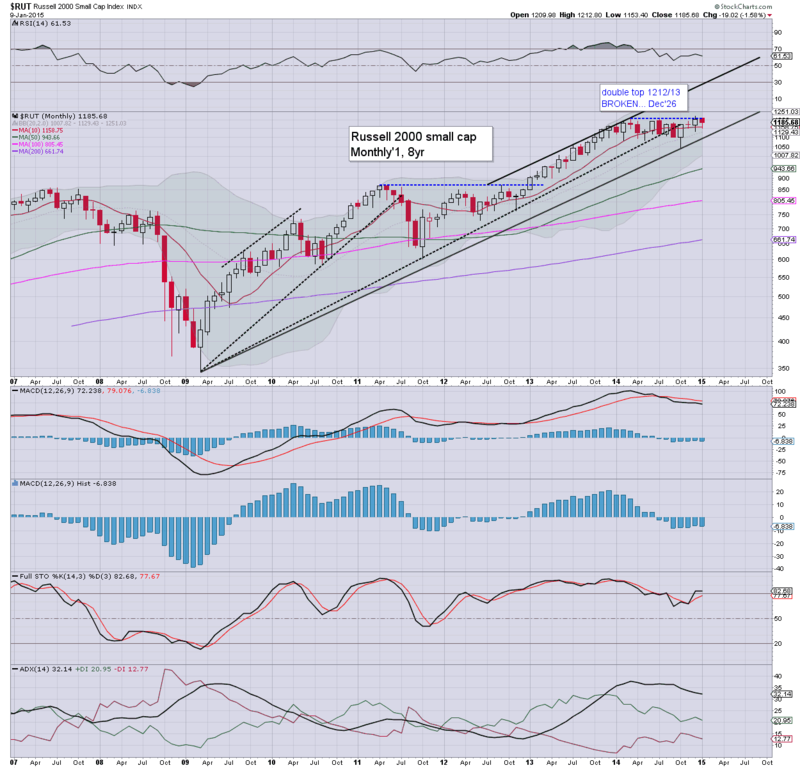 Certainly, the notion of sp'2300s by late spring/early summer will be dismissed by many, but it is viable if the market can hit the upper bol'... and then scrape along it (as often happens) for 2-4 months. Best guess remains.. broad upside to continue... 2100s near term... 2300s by spring.. and a year end close of 2575, although the latter will require an acceleration of the upward trend. The tech' remains very close to post 2009 highs. The bubble high of March 2000 (5132) remains a viable strike target by late spring. 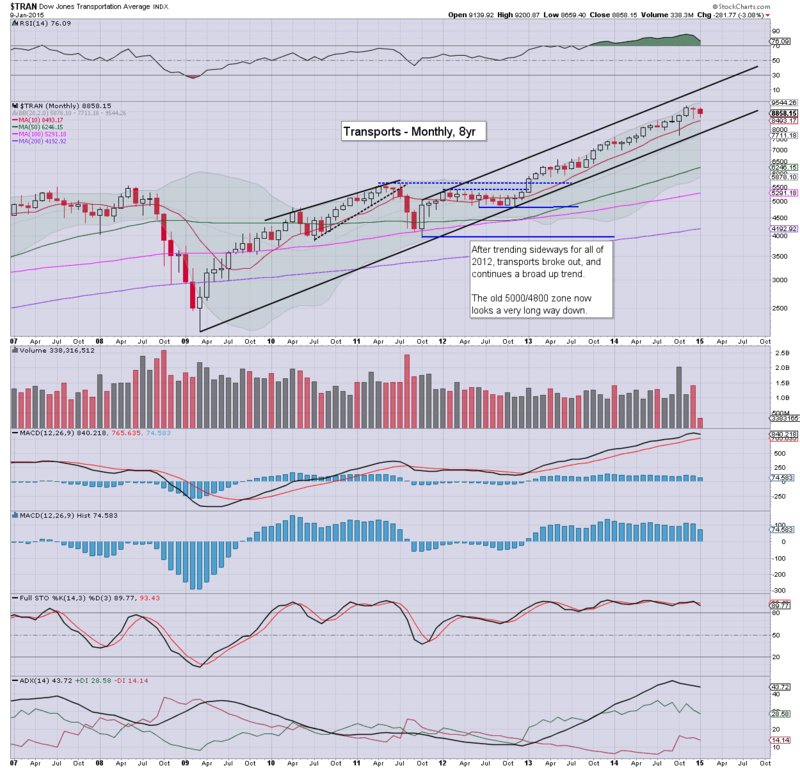 Any monthly close in the 5200s will open up a rather simple 'next step' target of 7k into 2016. The mighty Dow continues to hold core support of 17k, and has already come close (17951) to achieving a weekly close in the 18000s. The next fib' target remains 18971, which seems highly likely this spring, and if you can believe in that.. then the giant 20k threshold should be seen as almost equally viable. The master index is still struggling under the 11k threshold. Underlying MACD cycle is now negative for the third (or fourth) consecutive month... the last time that happened was summer 2012.. when sp'1266. Upper bol' is offering 11500/600s within the next 2-3 months. Unless equity bears can attain a monthly close <10k, there is nothing significantly bearish here. The second market leader is currently -1.6% for the month, but with 3 weeks left of the month, a Jan' close at new historic highs looks more probable than not. With 2014 closing with new highs, there is little reason why the R2K won't push into the 1250/75 zone in February. It is notable that the underlying MACD cycle remains quite a ways negative, lower for the 7th month, with the R2K having traded sideways in 2014. A broader upside target of the 1500s by late 2015 would seem overly bullish, but... that would merely be a resumption of the broader trend from 2009. The 'old leader' is lower by a rather significant -3.1% so far this year, but the broader trend remains fully intact. The giant 10k threshold looks viable in early summer. Transports will have a major problem once Oil prices put in a key multi-month floor, but it remains to be seen whether that will be WTIC Oil @ $45... or somewhere in the $35/30 zone. In any case.. Trans looks set to be the market laggard for the entire year. So... we're six trading days into 2015, and all the big indexes are in the red.. and that is despite a rather powerful two day bounce on Wed/Thursday. What is especially clear, the monthly 10MAs are holding as the first line of support. With 3 trading weeks left of the month, there is little reason why January can not close either flat.. or moderately higher. F - CPI, indust' prod', consumer sent. Friday is equity opex (VIX opex is not until the following Wed'). It is notable that US markets are CLOSED on the following Mon' 19th, so there will be some pre-holiday issues. It was a pretty mixed week for the US equity market. With the fifth consecutive daily decline, the market put in a spike floor of sp'1992... but then saw a powerful two day rebound. 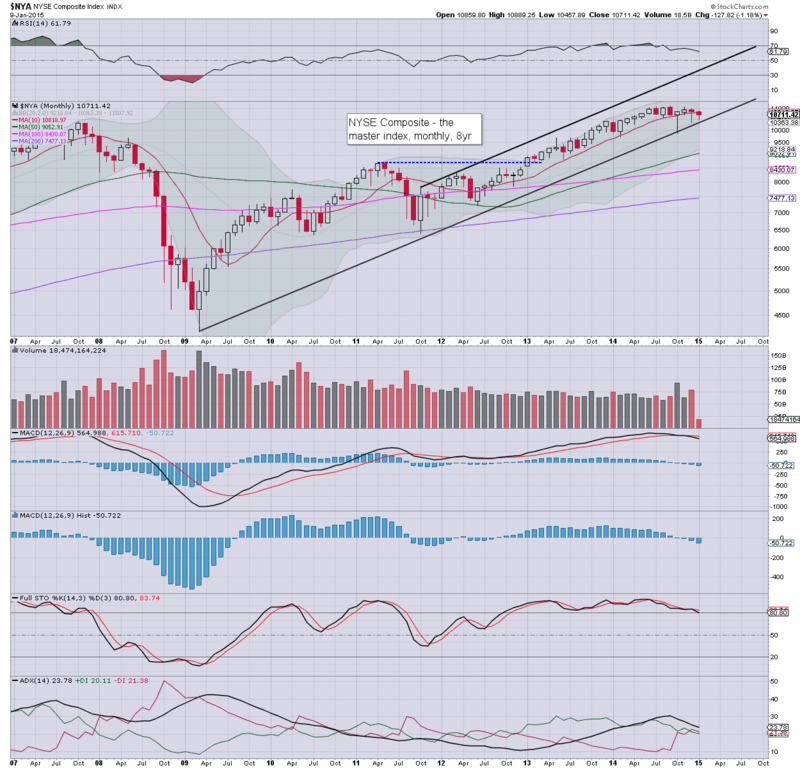 The sp'500 saw a net weekly decline of -13pts (-0.6%) @ 2044. The sp'2100s still look due. Suffice to say.. both sides can claim something of a victory this week. Bears ruled Mon/Tuesday... but the powerful gains of Wed/Thursday, were not exactly surprising. The closing blue weekly candle does offer some hope to the equity bears. 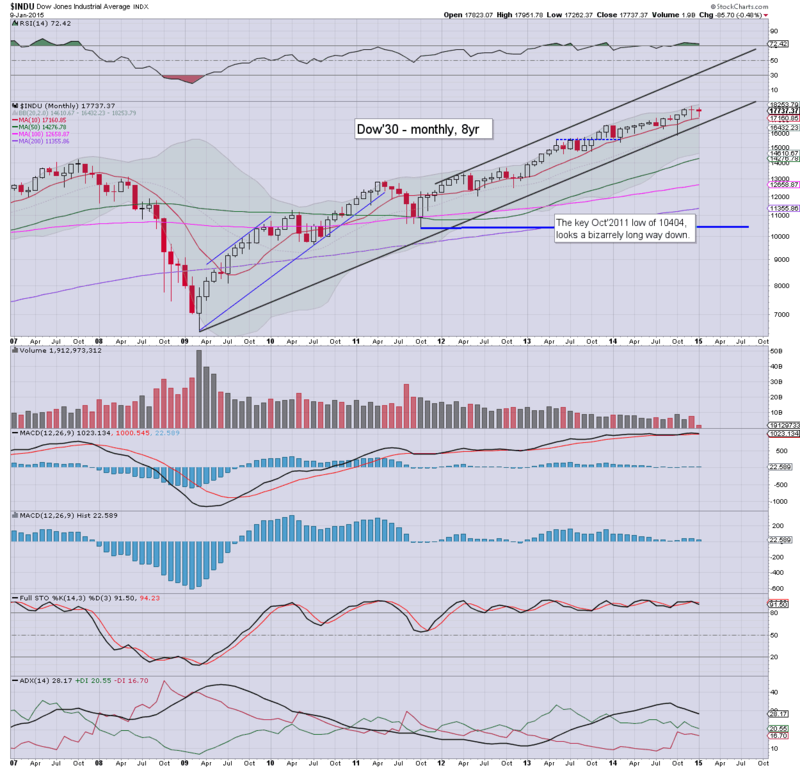 The most bearish 'reasonable' scenario right now would be another minor wave lower to test the 200dma in the sp'1960s. Yet that does seem unlikely. 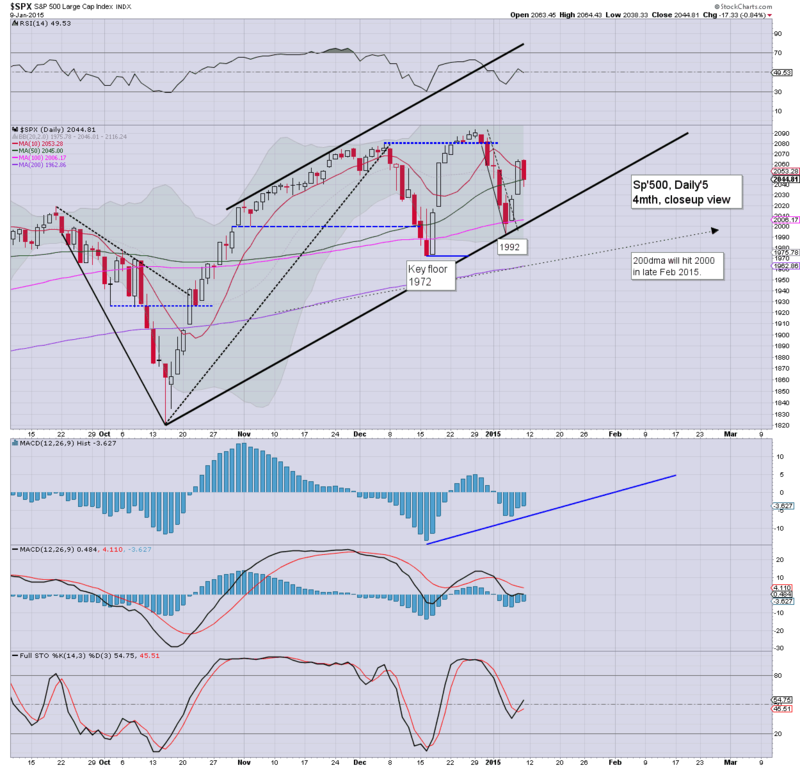 *I hold long the equity market across the weekend... seeking the sp'2090/2110 zone next week. US equities closed with borderline significant declines, sp -17pts @ 2044 (intra low 2038). The two leaders - Trans/R2K, settled lower by -1.1% and -0.9% respectively. 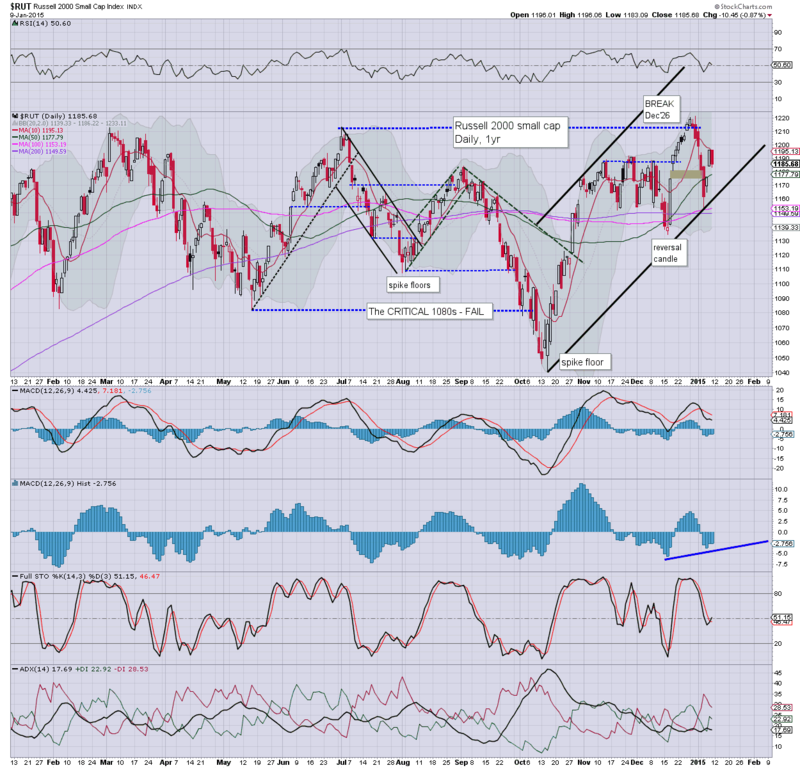 Near term outlook offers another push higher into the next opex, into the sp'2100s. Two powerful up days... with Friday seeing borderline significant declines. Overall.. it remains somewhat 'mixed'... but the broader trend remains a series of higher highs.. and higher lows. This remains no market for those seeking consistent and significant downside.